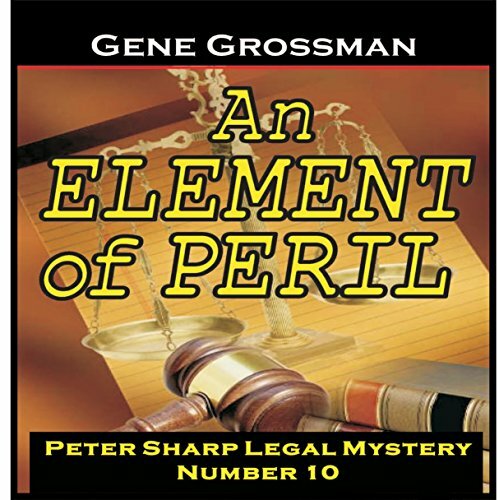 In An Element of Peril, the 10th Peter Sharp legal mystery, Peter faces a unique triple task: First, he must defend a domestic servant who has been charged with the chainsaw-killing of her boss; second, if he can get the servant acquitted, he must then defend the insurance company from being forced to pay a five-million-dollar life insurance policy on the boss's life by proving that she was not murdered and is still alive; and third, he must discover how the alleged corpse of the servant's boss disappeared - and if murder was faked, who planned it - and where the alive missing victim is. And somewhere behind the tangled mess of a downward-spiraling celebrity starlet, neighbor, a battling married couple of servants, a missing crooked currency trader and a disappearing corpse, attorney Peter Sharp and his legal ward Suzi must find where the truth lies...and what, if any, a bottle of booze has to do with anything - or everything. While the murder case against Peter's client's trial nears, Peter, Suzi, and the entire staff of the district attorney's office has failed to come up with any workable solution that can save Peter from certain defeat and humiliation in court, and attorney Peter Sharp isn't alone as the clock ticks down to his defeat, because you're guaranteed to be sitting on the edge of your chair during the courtroom drama that takes place during the last few minutes of the trial, that's so exhilarating, when the most important person in the courtroom suddenly has trouble breathing.